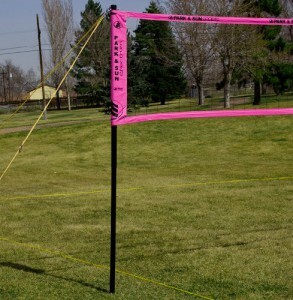 One of the most popular outdoor volleyball net systems for tournament and recreational players is the Park & Sun Spectrum 2000 Volleyball Net System. Park & Sun carries a variety of outdoor net systems that cater to different levels of play and budget. The Spectrum 2000 incorporates components and functionality suitable and ideal for all levels of play from beginner to professional. Pink, orange, white, blue and yellow are available as color options for the Spectrum 2000 system sleeve style net. The most common positive aspect of the Spectrum 2000 net system reported by most reviewers is how easy and quick it is to setup. 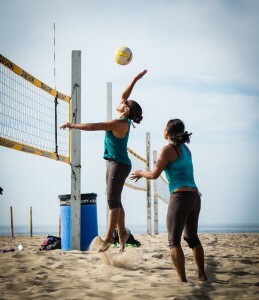 Majority of reviewers also agree that ball off the net play is really good with the included sleeve style net. Good durability also seems to be a recurring comment. Reviewers claim to have used this system several years regularly without it wearing down or becoming unusable. This net is reported to have been used with very good results on both sand and grass. Majority of the lower star reviews mentioned various issues with setup and use on sand. One functional issue for more than a few users is that the poles won’t telescope easily if any amount of sand gets on them. Several reviewers recommend the optional Park & Sun sand conversion kit or homemade planks to place under the poles when playing on sand. They mention how the poles will just sink into the sand without the kit or planks. One reviewer noted that the poles do not reach 8 feet and may require that something be placed under the poles in order for the net to be at 8 feet. On setup, a couple of users reported having issues with the tension rings. I currently own the Tournament 179 system because it fit my budget at the time I bought it. However, if budget wasn’t a factor I would have gone with either the Spectrum 2000 or the best of the best Spectrum Classic. Years later, the Tournament 179 still suits my needs just fine. For higher level recreational, club, scholastic, tournament or professional play, the Spectrum 2000 is the ideal choice if you’re looking for a balance between function and budget. amazon.com is one of the top distributors of Park & Sun outdoor volleyball net systems and my recommendation for purchasing the Spectrum 2000. They usually have the lowest price, free shipping, easy returns and no sales tax in most states.